Of all the real estate deeds, General Warranty Deeds provide the most protection to the grantee (buyer). This type of deed guarantees that the grantor (seller) holds clear title to a piece of real estate and has a right to sell it to the grantee. The guarantee is not limited to the time the grantor owned the property as with a special warranty deed; rather, it extends back to the property's earliest title. As such, earlier grantors occasionally find themselves confronted by issues from future grantees. The grantors also guarantee that, during their period of ownership, they did not encumber the property in any way that prohibits its transfer. Incorporate express references to any easements, restrictions, or other agreements of record that relate to the specific parcel of land, into the text of the deed. Providing this information puts the grantee on notice of the warranty's limitations and upholds the covenant against encumbrances. Traditionally, general warranty deeds include six common law covenants of title. Those six covenants can be separated into two categories: present covenants and future covenants. Save time and money. Get your real estate deed done right the first time. Each state has its own statutory requirements for warranty deed forms. These requirements determine the content or text that is in the deed. Warranty deed forms must meet statutory conditions for content and format. In addition, many local recording authorities add requirements for margins, paper size, property identification, and many other details. If a deed form is not in accordance with both the local and state standards, there may be additional fees charged for recording or the form may be rejected altogether. The right form matters. With warranty deeds, the little things can make a big difference. Deeds.com is meticulous about creating reliable and useful documents. Location, location, location. Our forms are formatted to exceed all requirements in your jurisdiction. There's never a doubt with a Deeds.com form, guaranteed. Accurate, up-to-date, and reviewed. We monitor ever changing government requirements and continually update our documents to be compliant with the latest laws. 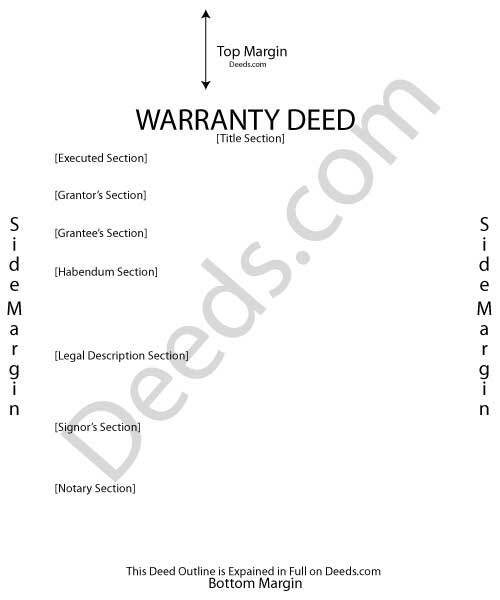 All of our warranty deed forms are available immediately after purchase. They are in Adobe PDF files and can be downloaded to your computer. They are fill-in-the blank on your computer so you can print them out completed. State laws, or statutes, determine the content of warranty deeds. Find out more about your state's requirements by clicking on the state where the property is located below.